© Curfs et al. ; Licensee Bentham Open. Classification methods that are currently being used for clinical decision making in thoracolumbar fractures, are limited by reproducibility and prognostic value. Additionally, they do not include kyphosis. As a posttraumatic kyphosis is related to persistent pain, it is of importance to determine a risk of posttraumatic kyphosis based on fracture type and patient characteristics. To determine risk factors (AO classification, age, gender, localization) that may lead to progressive kyphosis after a thoracolumbar fracture. Retrospective radiographic analysis of a consecutive patientcohort that presented in our clinic with a traumatic fracture of the thoracolumbar spine between 2004 and 2011. Cobb angle, Gardner angle, vertebral compression angle and anterior vertebral body compression were measured on plain radiographs, direct post-trauma and at follow-up. Age and localization are not significantly correlated, but there seems to be an increased risk of progression of kyphosis in age > 50 years and fractures localized at Th12 or L1. A3 type fractures are significantly more at risk for posttraumatic kyphosis compared to A1 and A2 type fractures. 30-50% of the A3 type fractures have an end Gardner angle and end vertebral compression angle of more than 20 degrees. AO-type A3 fractures appear to be at risk of progression of kyphosis. Localization at Th12-L1 and age above 50 years seem to be risk factors for significant posttraumatic kyphosis. These findings should be used in patient counseling and a meticulous evaluation by weekly radiographs is recommended to determine the treatment strategy of thoracolumbar fractures. Keywords: Classification, fracture, fracture, prognosis, radiological prediction, spine, treatment. Reported incidences of traumatic fractures of the thoracolumbar spine vary from 1 in every 150.000 in the Netherlands to 1 in 350.000 reported in the United States. Thoracolumbar fractures are debilitating and may lead to variable outcomes [1, 2]. Historical series, before the introduction of surgical stabilization, showed deleterious results of conservative treatment [3, 4]. These disappointing results may have been due to limited information from imaging as in more recent series with better selection criteria based on advanced imaging the results have improved dramatically [5-8]. On these imaging criteria, various classification systems have been based. Denis based his classification on the three column theory: anterior-middle-posterior column as assessed on CT-scan. Both AO and Denis classify the fractures to their morphology, resulting in following types: 1) compression type, including burst; 2) distraction type; 3) rotational type . All currently used classification methods have variable or unknown reproducibility (intra- and inter-observer validity) and do not include a reliable estimation of prognosis for the determination of the best treatment . Because of these limitations in 2007 the ThoracoLumbar Injury Classification and Severity score (TLICS) was developed, in which not only fracture morphology, but also fracture mechanism has been incorporated. Furthermore, this classification pays attention to the neurological status of the patient and the integrity of the posterior ligament complex . The loss of sagittal balance due to an increased kyphosis is believed to be the main cause of posttraumatic spinal problems with concurring pain . Bergstrom et al. studied late sequelae of spinal fractures and found that there is no evidence that the bony injury to the vertebral column itself influences the development of late scoliosis or lordosis, however, vertebral bony injury may induce the development kyphosis. Secondary treatment of kyphotic deformity is challenging and often disappointing . None of the prior mentioned classification methods have incorporated parameters to evaluate vertebral kyphosis or height loss as possible predictors of secondary kyphotic deformity. Several methods are available to evaluate kyphosis on radiological exams. The Cobb angle, Gardner angle, vertebral compression angle (VCA) and anterior vertebral body compression (AVBC) percentage Fig. (1) have been described as useful and reliable measurements in the evaluation of thoracolumbar fractures [15-17]. The purpose of this study is to investigate whether it is possible to predict the fractures at risk for a progressive angular kyphosis, by means of radiologic features, age, localization or classification. A consecutive series of 104 patients who presented with a traumatic thoracolumbar fracture between 2004 and 2011, were included for evaluation. We excluded patients older than 70 years, and patients who received surgical treatment. Furthermore spontaneous fractures, fractures after minor trauma or patients with proven osteoporosis were excluded. After exclusion there were 63 patients left for evaluation. Data was collected from patient files. We searched for age, gender, date and mechanism of trauma, treatment, BMI and bone density. However, no information about weight, height or BMI was available, and just in a few patients a DEXA scan was performed. Plain radiographs of the thoracolumbar spine directly post trauma and at a minimum follow-up of 6 weeks (mean 13 weeks, range of 6-38 weeks) were compared retrospectively. Based on the radiographs, the fractures were classified according to the AO classification  using available CT. Additionally, the following measurements were performed using plain radiographs (Fig. 1) . Retrospective analysis of the radiographs (classification according to AO, as well as the measurements) was performed by the first author, who was blinded to the patients, primary classification and treatment decision. Data analysis was performed using Statistical Package for the Social Science (SPSS) 17.0 (Chicago, Illinois, USA). Subgroups were stratified for age (<50 and >50), localization (Th10-11, Th12, L1, L2 and L3-5) and classification (A1, A2, A3, and B). Differences of the mean of age, localization, and classification with the end values and the differences between start and end values (Δ) were checked among groups using ANOVA and t-test. Level of significance was set at p < 0.05. Thirty-three men and thirty women, with a mean age of 46.5 years (range 14-70 years) were treated for 73 spinal fractures, 54 uni- and 9 multi-segmental. Seventy-three % of the fractures were localized at L1 or T12. Demographics and fracture characteristics are listed in Table 1. All patients received conservative treatment, consisting of analgetics, physiotherapy (exercise) and 55 patients were immobilized with spinal cast or brace. Seven of the 63 patients have had a DEXA scan, with normal outcome or mild osteopenia. From one of the patients the BMD value of the lumbar spine was not measured because of a cast. The mean BMD value of the lumbar spine in the other six patients is 0,985 g/m2 , with a range between 0,884 g/cm2 and 1,198g/cm2. Patients with age above 50 were compared to parameters of patients younger than 50 years of age. With age above 50 years, all angles increased more over time than patients younger than 50 years of age, however, these findings were not significant. Results are summarized in Table 2. The end anterior vertebral body compression was significantly lower for the older patients. The mean end AVBC was 63% and 55% respectively for the group of patients younger than 50 years and patients above 50 years of age (t-test p=0.02). For patients above 50 years, the mean delta AVBC was 6% compared to 4% for patients < 50 years. Most of the fractures were localized at Th12 or L1. For the comparison, three groups were made: Th12, L1 and all the other levels (Th10-11, L2-3-4-5). As Cobb angle is in normal anatomy the highest at the thoracolumbar junction, this parameter was not used for comparison. Delta values of angles and AVBC of patients <50 years compared to patients >50 years. Mean, standard deviation and range are visible in table. There was a trend towards worse end VCA for fractures localized at Th12 or L1 (p 0.06). Mean end VCA was 13.09 and 13.83 for Th12 and L1 respectively, compared to an end VCA of 10.95 degrees for the other levels. Delta VCA angle seemed worse in fractures localised at Th12. A significant worse end gardner angle was found for fractures localized at Th12 or L1 compared to the other levels (Th12 14.9 degrees, L1 15.9 degrees, other levels 11.0 degrees). However, also gardner angle is influenced by normal anatomy already, and the delta gardner angle did show comparable outcome for all levels. No differences were found concerning the anterior vertebral body compression percentage. See overview of the results in Table 3. 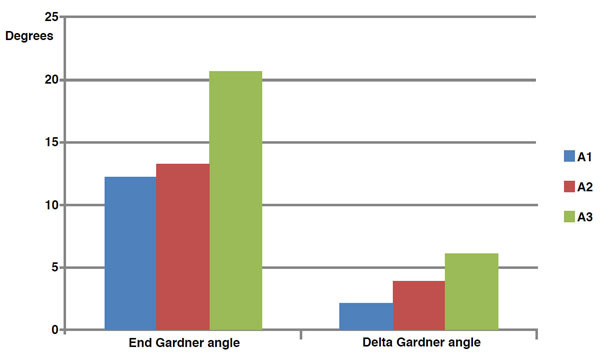 Overview of delta and end Gardner and VCA angles and AVBC percentage associated with localization. Mean values and standard deviation are shown. Most fractures were classified as AO type A1. Three fractures were classified as B-type fractures. These fractures were probably misdiagnosed. However it were only three fractures, radiological outcome was quite similar to A3 type fractures. With regard to end kyphosis angles, AO type A1 had best outcome, followed by AO type A2 and AO type A3/B showed worst outcome. All parameters were significantly worse for AO type A3 compared to A1. Results are shown in Table 4. End values of angles and compression percentage compared to classification. Mean, standard deviation and range are shown. End Gardner angle was 12.1 degrees for A1 type fractures, compared to 20.7 degrees for A3 type. Also the progression is higher in A3 type, shown by a delta gardner angle of 2.1 degrees for A1 and 6.2 degrees for A3. A2 type fractures had a mean end Gardner angle of 13.3 degrees and mean delta angle of 3.9 degrees (Fig. 2). Results of AO classification versus Gardner angle A3 type fractures have worse outcome than A1 and A2 type fractures. The end AVBC was 67% for A1, 65% for A2 and 53% for A3 type fractures (P < 0.01). The delta AVBC was highest for AO type A3 fractures, with values of respectively 2%, 4% and 10% for A1, A2 and A3 fractures (p< 0.01). Also VCA showed worst results for A3 type fractures. Delta VCA was 1.0 degrees for A1, 3.9 degrees for A2 and 4.2 degrees for A3 fractures. End VCA was respectively 11.1 degrees, 12.8 degrees and 17.5 degrees for A1, A2 and A3. Cobb angles increased also with AO classification, with a mean end Cobb angle of 10.1 degrees for A1, 11.3 degrees for A2 and 16.0 degrees for A3. The increase of Cobb angle during time was 1.8 degrees for A1, 2.9 degrees for A2 and 4.1 degrees for A3. End Gardner, Cobb or VCA angles of more than 20 degrees or delta angles of more than 10 degrees, seem of clinical importance because of their possible influence on the sagital balance. Therefor we measured the percentage of fractures that met these criteria, and noticed that 30-50% of all AO type A3 fractures had such angles (Table 5). Overview of angles versus AO classification. Percentage of fractures with delta angle of more than 10 degrees or end kyphotic angle of more than 20 degrees. This study was intended to predict progressive posttraumatic kyphosis after a thoracolumbar fracture based on plain radiographs. AO-type A3 fractures appear to be at risk of progression of kyphosis, with 30-50% of the fractures have end kyphotic angles of more than 20 degrees. Localization at Th12-L1 and age above 50 years also seem to be risk factors for significant posttraumatic kyphosis. These findings should be used in patient counseling and a meticulous evaluation by weekly radiographs of progression of kyphosis is recommended to determine the treatment strategy. CT should be used to judge the end plate comminution and vertebral body involvement. Careful analysis of concomitant injury of the posterior ligament complex (PLC) by means of a MRI could be advocated in these fractures. Involvement of the posterior column in fracture morphology could also be suggested on PA radiographs by an increased distance of the vertical pedicle or on axial CT-images by the separation of a facet joint. It is important to pay attention to the position of the processes spinosi on the sagittal view, and the distance between the pedicles and processes spinosi on the coronal view of plain radiographs and CT-scans (Schnake et al.). Misinterpretation of the integrity of the PLC may explain the higher rate of progression to kyphotic deformity of A3 fractures. In case of involvement of the posterior ligament complex a fracture should be classified as B type fracture, and then surgical treatment is recommended. In Figs. (3 & 4) we show some X-rays of such a A3 type fracture with worse outcome. Direct trauma X-rays and CT of a 37-year old male with a L1 fracture, classified as a burst fracture (A3 type). There is minimal angulation or kyphosis, and there are no signs of involvement of the posterior ligament complex. Gardner angle = 16 degrees. VCA = 10 degrees. 3a=sagittal view; 3b= PA-view; 3c = sagittal CT; 3d = sagittal X-rays with Gardner angle (red line) and VCA (black line). Schnake et al. performed a study on the reliability of fracture classification, mainly for B-fractures. They found that initially almost 42% of the B-type fractures were misdiagnosed as type A. Compared to our findings Schnake et al. listed a vertebral kyphotic angle of >15 degrees, a pronounced compression of vertebral cancellous bone despite minimal reduced anterior vertebral height, and a considerably reduced anterior vertebral height of over 50% to be considered as red flag symptoms. Oner et al. suggested to integrate MRI findings into future classification schemes of thoracolumbar spine fractures for a better diagnosis and prognosis of the fractures. In the STIR sequences the presence of a high signal indicates injury in the PLC area. In our study, MRI had not been performed routinely in all patients. However, in 2002 Öner et al. also published a study in which conservative and operative treatment of thoracolumbar fractures were compared, and routinely trauma MRI was made to identify predictors for worse outcome. They concluded that an unfavorable outcome was related to the progression of kyphosis. In the conservative group this seemed predictable concerning the endplate comminution and vertebral body involvement. In the operatively treated group, recurrence of the kyphotic deformity was predictable by the lesion of the posterior longitudinal ligamentary complex together with endplate comminution and vertebral body involvement. So, misinterpretation of the PLC might be one of the issues related to posttraumatic kyphosis, but end plate comminution and vertebral body involvement also seem to be of importance. This is shown by the AVBC parameters, and in our results this parameters is negatively influenced by age and classification (worse outcome age < 50 years and in A3 fractures). Eight weeks post-trauma X-rays of the patient in Fig. (3). There is an increase of kyphosis and height loss. On the lateral radiograph a little gap in the facet joint is seen, which could be a sign of involvement of the PLC. Gardner angle = 27 degrees. VCA = 20 degrees. 4a = sagittal X-ray, suggestion of little gap in facet joint is marked with an arrow; 4b = PA view; 4c = sagittal radiograph with Gardner angle (red line) and VCA (black line). In our study clinical outcomes were not included, but in literature kyphotic deformity is considered to have a positive association with chronic back pain [12-14]. Therefore, it is considered important to investigate whether principal morphology and patient demographics are of influence on the progression of kyphosis. We are aware of the limitations of this study. The population is relatively small and existed of patients with a wide range of age. Furthermore we could not analyze the sagittal balance of the individual spinal column, since full spine radiographs were not available. Ideally, these are also available at pre-injury stage for optimal comparison, although this is practically not feasible. In conclusion however, all AO-type A3 fractures, mainly in patients older than 50 years, and localized at the thoracolumbar junction, appear to be at risk of progression of kyphosis. These findings should be used in patient counseling and a meticulous evaluation of the fracture is recommended to assess vertebral body involvement and the integrity of the PLC. Weekly radiographs are recommended, and CT and/or a routinely MRI should be considered in these cases, to determine the treatment strategy. Fisher CG, Noonan VK, Dvorak MF. Changing face of spine trauma care in North America. Spine (Phila Pa 1976) 2006; 15(31)(11 Suppl): S2-8. discussion S36. Hu R, Mustard CA, Burns C. Epidemiology of incident spinal fracture in a complete population. Spine (Phila Pa 1976) 1996; 21(4): 492-9. Denis F. The three column spine and its significance in the classification of acute thoracolumbar spinal injuries. Spine 1983; 8(8): 817-31. Willén J, Anderson J, Toomoka K, Singer K. The natural history of burst fractures at the thoracolumbar junction. J Spinal Disord 1990; 3(1): 39-46.
 de Klerk LW, Fontijne WP, Stijnen T, Braakman R, Tanghe HL, van Linge B. Spontaneous remodeling of the spinal canal after conservative management of thoracolumbar burst fractures. Spine 1998; 23(9): 1057-60. Mumford J, Weinstein JN, Spratt KF, Goel VK. Thoracolumbar burst fractures. The clinical efficacy and outcome of nonoperative management. Spine 1993; 18(8): 955-70. Shen WJ, Shen YS. Nonsurgical treatment of three-column thoracolumbar junction burst fractures without neurologic deficit. Spine 1999; 24(4): 412-5. Shen WJ, Liu TJ, Shen YS. Nonoperative treatment versus posterior fixation for thoracolumbar junction burst fractures without neurologic deficit. Spine 2001; 26(9): 1038-45. Magerl F, Aebi M, Gertzbein SD, Harms J, Nazarian S. A comprehensive classification of thoracic and lumbar injuries. Eur Spine J 1994; 3(4): 184-201. Wood KB, Khanna G, Vaccaro AR, Arnold PM, Harris MB, Mehbod AA. Assessment of two thoracolumbar fracture classification systems as used by multiple surgeons. J Bone Joint Surg Am 2005; 87(7): 1423-9. Lenarz CJ, Place HM, Lenke LG, Alander DH, Oliver D. Comparative reliability of 3 thoracolumbar fracture classification systems. J Spinal Disord Tech 2009; 22(6): 422-7. Buchowski JM, Kuhns CA, Bridwell KH, Lenke LG. Surgical management of posttraumatic thoracolumbar kyphosis. Spine J 2008; 8(4): 666-77. Bergström EM, Henderson NJ, Short DJ, Frankel HL, Jones PR. The relation of thoracic and lumbar fracture configuration to the development of late deformity in childhood spinal cord injury. Spine 2003; 28(2): 171-6. Doo TH, Shin DA, Kim HI, et al. Clinical relevance of pain patterns in osteoporotic vertebral compression fractures. J Korean Med Sci 2008; 23(6): 1005-10. Keynan O, Fisher CG, Vaccaro A, et al. Radiographic measurement parameters in thoracolumbar fractures: a systematic review and consensus statement of the spine trauma study group. Spine 2006; 31(5): E156-65. Street J, Lenehan B, Albietz J, Bishop P, Dvorak M, Fisher C. Intraobserver and interobserver reliabilty of measures of kyphosis in thoracolumbar fractures. Spine J 2009; 9(6): 464-9. Ulmar B, Gühring M, Schmälzle T, Weise K, Badke A, Brunner A. Inter- and intra-observer reliability of the Cobb angle in the measurement of vertebral, local and segmental kyphosis of traumatic lumbar spine fractures in the lateral X-ray. Arch Orthop Trauma Surg 2010; 130(12): 1533-8. Schnake KJ, von Scotti F, Haas NP, Kandziora F. Type B injuries of the thoracolumbar spine : misinterpretations of the integrity of the posterior ligament complex using radiologic diagnostics. Unfallchirurg 2008; 111(12): 977-84. Oner FC, van Gils AP, Dhert WJ, Verbout AJ. MRI findings of thoracolumbar spine fractures: a categorisation based on MRI examinations of 100 fractures. Skeletal Radiol 1999; 28(8): 433-43. Oner FC, van Gils AP, Faber JA, Dhert WJ, Verbout AJ. Some complications of common treatment schemes of thoracolumbar spine fractures can be predicted with magnetic resonance imaging: prospective study of 53 patients with 71 fractures. Spine 2002; 27(6): 629-36.